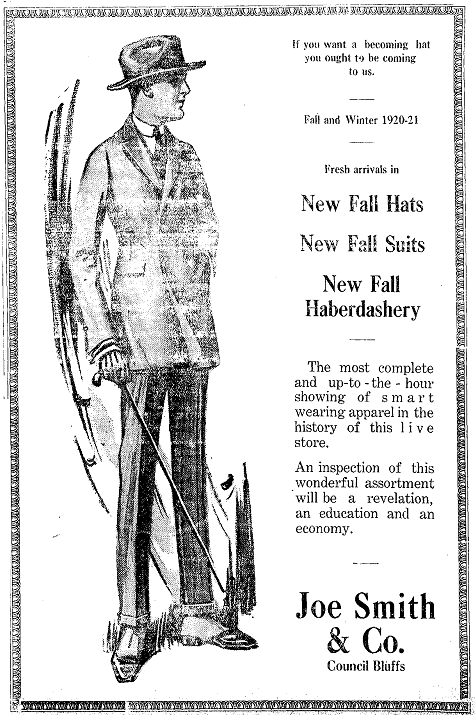 First we’ll start out with an ad on hats, because it has the word haberdashery. After that is an article from the Wisconsin State Journal on Carol II of Romania, who was visiting the United States at the time. The image of the article follows the text here. CAROL HERE TO LEARN FROM U.S. PRINCE CAROL, crown prince of Rumania, and his retinue of 11 men, expressed themselves highly pleased with Madison and its many beauties today, after a hurried trip through the agricultural college of the university. The prince, but for a certain trick of raising the shoulders and using his hands considerably in talking, might pass for an ordinary American citizen. He has a decided aversion to interviewing reporters, and has absolutely refused to talk with any of them on his trip through the United States. “The prince is travelling here unofficially,” declared S. E. Nicolae Filodor, minister to Greece, who is travelling with the prince. “And as he is averse to talking with newspaper folk, he is avoiding any interviews at all. When we first landed on the western coast, he granted an interview to a reporter, who grossly misquoted His Highness, and so the prince declared he would give no interviews to reporters. Except for an occasional “Your Excellency” or “Your Highness,” one would not realize that there was royalty in the little group that visited the city this morning. After the trip through the agricultural buildings, the party was taken on a visit through the Historical library, after which it adjourned to the Madison club for lunch, and left at 1:45 for Chicago. The one thing which greatly pleased His Highness and others of the royal party was the cleanliness of Madison. Monsieur Filodor exclaimed over the cleanliness of Madison streets and buildings. Prince Carol and his retinue of 11 members arrived in Madison at 7:55 this morning in a private car, on the Northwestern train from Minneapolis. They weer met at the depot by Dean H. L. Russell of the university college of agriculture, H.J. Thorkelson, business manager of the university, M.E. McCaffrey, secretary of the board of regents, F.B. Morrison, director of the agricultural experiment station, and A.W. Hopkins, agricultural editor. The party proceeded to the Madison club for breakfast, where Dr. Charles H. Vilas, president of the board of university regents, joined them. After breakfast, the party went directly to the university to meet President E.A. Birge, and then on a tour of the college of agriculture. Here they were shown films of work done at the university, and visited the buildings and university farm. The prince is a fine appearing young man, about 27. He is tall, slender and graceful of carriage. His wavy hair is light brown, parted on the side, and he affects a closely trimmed mustache. He wore a dark suit, a soft felt hat, and carried a cane. According to the Rumanian consulate, Prince Carol Hohenzollern von Siegmaringen of Rumania, he is the eldest son of King Ferdinand and Queen Marie of Rumania, is travelling incognito, but he is being well presented in his trip throughout the country. He travelled as an emissary to Japan from his country, and is now en route home. He will spend Friday in Chicago, leaving Friday night for New York, and sailing Aug. 27 for Europe. It is said that Prince Carol is on a world tour to forget his pretty Parisian wife. Zizi Lambrino, whom he morganatically married in 1913, and from whom after months of controversy, his parents succeeded in separating him. While in St. Paul yesterday, Prince Carol saw his first baseball game, when he watched St. Paul and Indianapolis play. He asked for one of the base balls, which was given him and autographed by Manager Mike Kelly of the Saints.